MSM Organic Sulfur Crystals has been proven effective against Arthritis, Joint, muscle pain. MSM organic sulfur is used for natural organic whole body detoxification. MSM organic sulfur has been proven to help relieve common allergies. SULFUR DEFENSE PLUS is one of the best all-around antioxidant supplements on the market. It is also an amazing sports drink for hydration and joint protection. 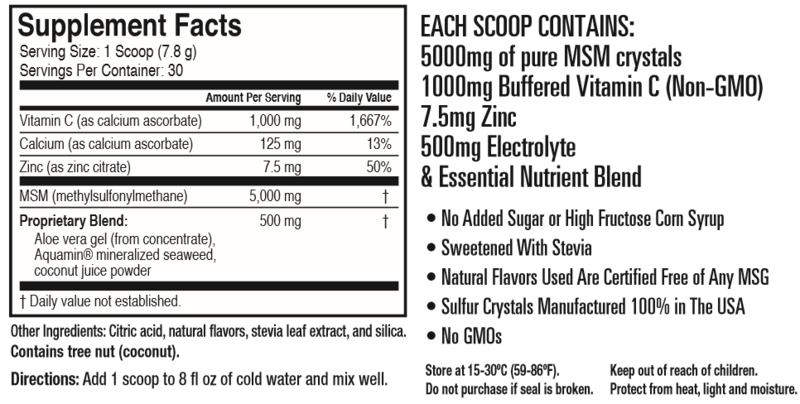 This product contains 5 grams of pure MSM Sulfur Crystals per serving, 1000 mgs of non-GMO buffered vitamin C, 7.5 mgs of Zinc, and a 500 mg blend of trace minerals that supply vital electrolytes to the body. This product is extremely beneficial for the cold and flu season. MSM has been proven effective against arthritis, joint pain, muscle pain, inflammation allergies and so much more! Taking Vitamin C with MSM makes it far more effective because sulfur is a catalyst that helps deliver nutrition into the cells more efficiently making all of your nutrition more bioavailable. Not only do you obtain all of the amazing health benefits that sulfur offers, you get all the antioxidant benefits of vitamin C. SULFUR DEFENSE PLUS is a delicious Lemon Drop flavored supplement that is needed daily for maximum cell protection and support. SULFUR DEFENSE PLUS uses a certified non-GMO source of buffered vitamin C and contains absolutely no sugar or high fructose corn syrup added at all. We use Stevia to sweeten the product. The natural flavoring we use contains no MSG. We also have the best source of Organic Sulfur (MSM) on the market using the only certified GRAS status MSM that is 100% American made, and has gone through a four stage distillation process to ensure purity and quality. This product mixes easily, tastes great and works incredibly well. It’s time to hop on the Sulfur Express.